Question of the day: “My gums receded and I hate the way it looks and feels. Can you fix this? 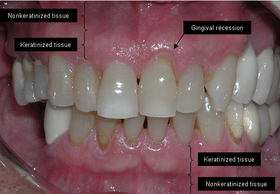 Most of the time, we can re-postion gums that have receded. It’s surgical procedure called a gingival graft, and there are two types: First–we can slide the gum back into place if you have enough of the necessary tissue [called attached tissue]. Second, we can regrow more attached tissue if needed by removing skin from the roof of your mouth [or palate–which becomes new attached tissue], and then suturing the area back together [the video below shows the second type of repair]. The first surgery–or sliding repair is generally an easier recovery, but often can’t be used due to lack of attached tissue. This important difference in surgery makes the diagnosis of the problem and treatment planning very important.